These Belgian yeast waffles are dense, flavorful and worth the extra time it takes the batter to rise before cooking them to golden perfection. Growing up, the only waffles I ever had were made from a box of Bisquick. There wasn’t anything special about them and I don’t remember ever requesting them as a kid, although I still ate them when they were served. Fast forward 20+ years and I’m making waffles for my own family. I still use the mix when I’m on a time crunch and need a last minute dinner, but when I plan ahead, these waffles are the ones I make for my family. 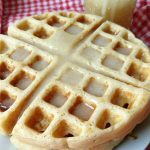 Yeast waffles are a little different than other waffle recipes because you have to let the batter rise before making the waffles. But the result is a flavor packed Belgian waffle that’s crispy on the outside and soft on the inside. One note before getting started: notice that you need two types of flour for this recipe–white flour and white whole wheat flour. You should be able to find the white whole wheat flour next to the other types of flour on the baking aisle. First, grab yourself two mixing bowls: one medium and one extra large. 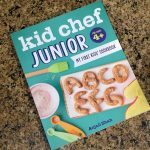 Combine the flour, salt, sugar, yeast , baking powder and baking soda in the large bowl. You want to make sure that you are using a really big bowl because as the batter rises, it will take up a lot more space that you expect. Mix together with a whisk. Next, heat the milk in a microwave safe bowl or measuring cup just until warm. I’d recommend heating it in 30 second intervals and stirring in between to evenly distribute the heat. Add the oil and eggs to the milk and stir well. Pour the milk mixture into the bowl with the flour mixture. Stir together until combined but don’t overmix. Let the batter rest for 30-60 minutes until doubled. When it’s done, it will be very bubbly. Heat up your waffle iron. Grab a measuring cup to scoop the batter out of the bowl and onto the iron. I always spray mine with cooking spray just to make sure it won’t stick. You will have to play around with exactly how much batter your iron needs to make a full waffle. The quantities for this recipe are based off of a 7″ waffle. Also, something you’ll notice is the batter is runnier than regular waffle/pancake mix. 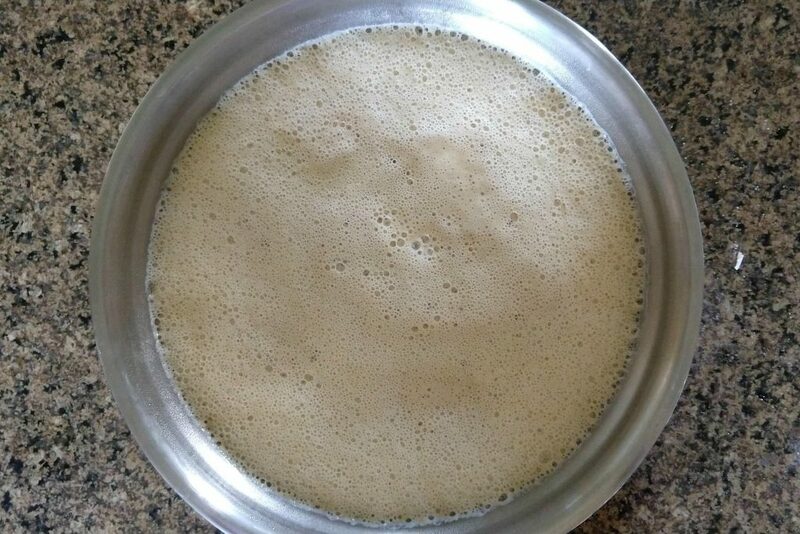 This is just due to the yeast and the batter will still cook up just fine. When you pull the waffle off the iron, put it on a cooling rack. This will help prevent the bottom from getting soggy. Top your waffles with fruit and whipping cream or my buttermilk syrup and enjoy! 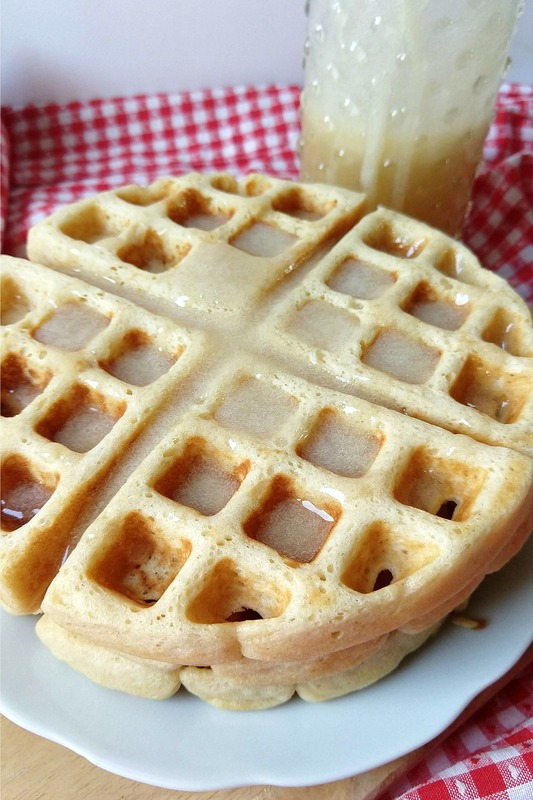 Flavorful and crispy, these yeast waffles will become your go-to recipe! First, grab two mixing bowls: one medium and one extra large. 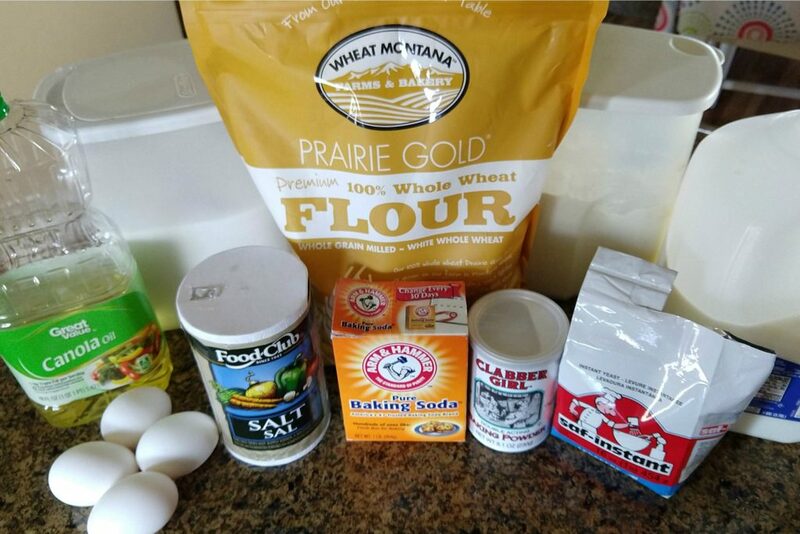 Combine the flour, salt, sugar, yeast , baking powder and baking soda in the large bowl. You want to make sure that you are using a really big bowl because as the batter rises, it will take up a lot more space that you expect. Mix together with a whisk. Next, heat the milk in a microwave safe bowl or measuring cup just until warm. I'd recommend heating it in 30 second intervals and stirring in between to evenly distribute the heat. Add the oil and eggs to the milk and stir well. 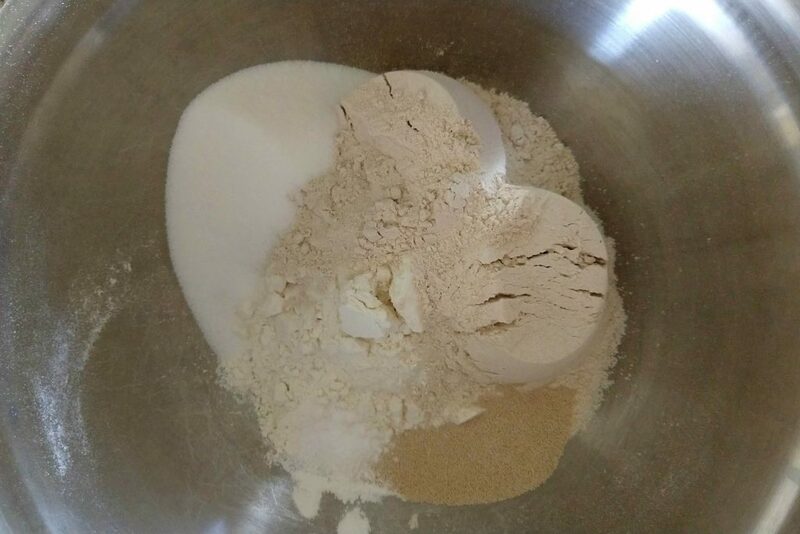 Pour the milk mixture into the bowl with the flour mixture. Stir together until combined but don't overmix. Let the batter rest for 30-60 minutes until doubled. When it's done, it will be very bubbly. Heat up your waffle iron. 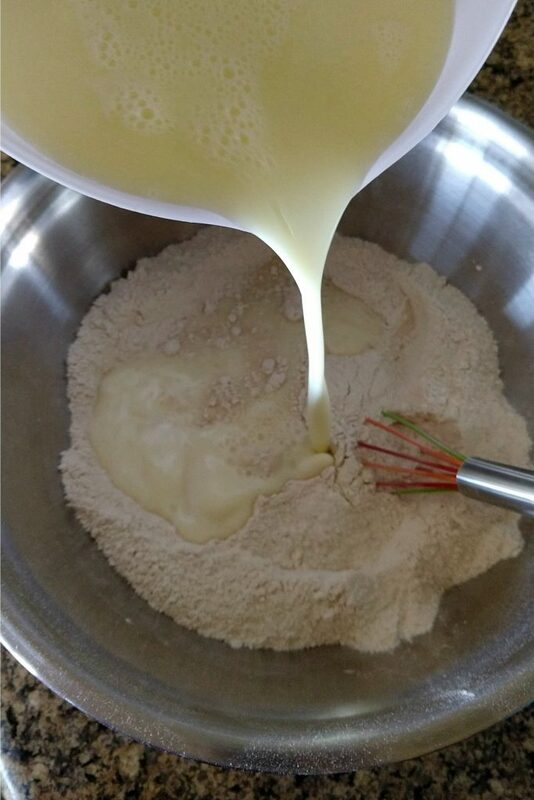 Grab a measuring cup to scoop the batter out of the bowl and onto the iron. I always spray mine with cooking spray just to make sure it won't stick. You will have to play around with exactly how much batter your iron needs to make a full waffle. The quantities for this recipe are based off of a 7" waffle. Top your waffles with fruit and whipping cream or my buttermilk syrup (recipe coming soon) and enjoy! *Tip* When you pull the waffle off the iron, put it on a cooling rack. This will help prevent the bottom from getting soggy. 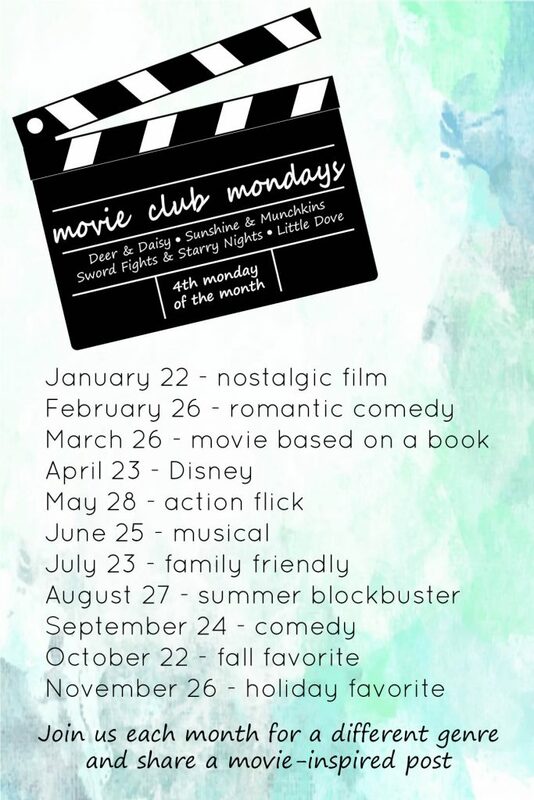 Check out the other posts from our co-hosts and share your own posts inspired by a comedy. Next month the theme is FALL FAVORITE. So at first I thought the movie was going to be Shrek (“And in the morning I’m making WAFFLES!”) but yes, I totally remember that part of the movie and I love it! Such a yummy treat, love this! 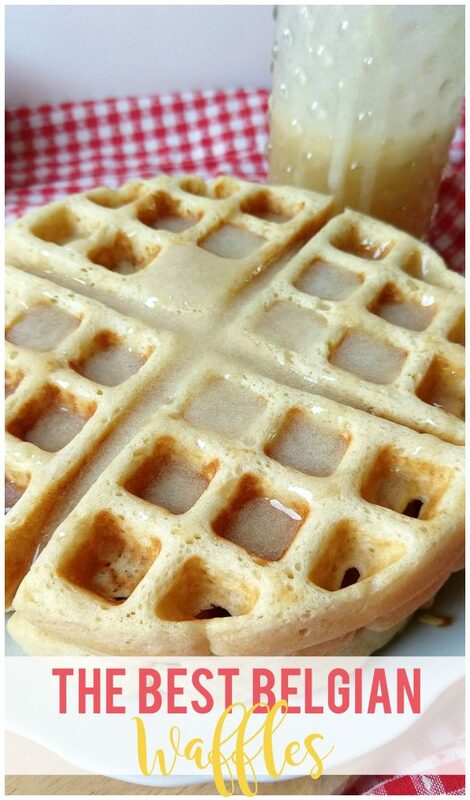 I love that movie and this waffle recipe looks delicious. I’m going to have to try it for our next breakfast for dinner night. Haha, since I never seem to actually make breakfast for breakfast! These look really good. I like your tip about putting them on a cooling rack after you pull them off the iron. That makes total sense! These look so delicious! My kids love waffles but I usually use a mix. I’m going to have to try your recipe. Yum! Oh wow. These look delicious! 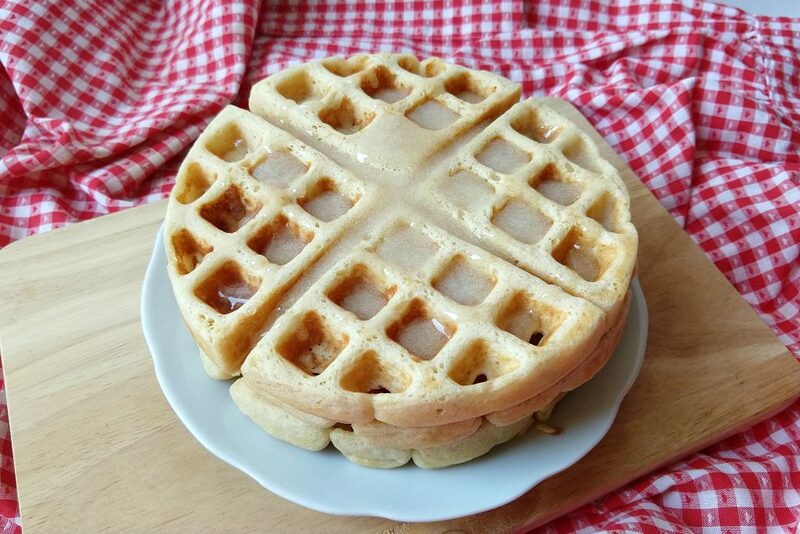 I love good waffles – but I haven’t tried them homemade. Maybe I should put a waffle iron on my wish list! Waffles are a necessity in our home!